The only guide you'll need for getting around Bali & Lombok. Everything you need is in this one convenient package—including a large pull-out map! 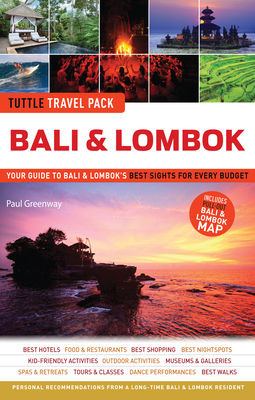 Bali & Lombok Tuttle Travel Pack is your passport to an unforgettable journey to Asia's favorite tropical islands. Author Paul Greenway is a seasoned travel writer and frequent visitor to these islands, and he recommends the very best places and activities—from the dramatic cliff-top temple at Ulu Watu with its entrancing Barong dance, to the cool highland lakes of Bratan and Bedugul with their hot springs and lush greenery, to the trendy beach resorts and boutiques of Seminyak, the idyllic beaches of the Gili Islands off Lombok. Bali & Lombok's top sights and activities, from the famous Tanah Lot temple on Bali's southern coast to Ubud's Sarawasti Palace, where the best traditional dances are performed. A series of 2-day and 3-day excursions covering each major region of these islands, with a series of personalized guided tours covering all the most important sights and temples. Personal recommendations by the author for the best services and facilities on Bali and Lombok—the best hotels and resorts; the best shopping and restaurants; the best outdoor activities and traditional performances; the best kid-friendly activities and beaches; and more. Easy-to-use and easy-to-carry, this Bali travel guide is packed with fascinating information, handy lists, useful maps and photographs, and tips on how to make the most of your stay with limited time. The author provides pointers on getting around, basic Indonesian phrases, tips on temple ceremonies and etiquette, and essential travel facts (getting a visa, changing money, where to find the best hotels, food, beaches, and shopping). Extraordinarily useful and well thought-out, Bali & Lombok Tuttle Travel Pack contains a large pull-out map at the back, making it your complete travel companion for an exciting journey of discovery. Paul Greenway is based in Adelaide, South Australia—but his heart is always in Indonesia, particularly Bali. He has contributed to over 30 guidebooks including the Lonely Planet guides to Bali & Lombok and Indonesia. He has traveled extensively throughout the Indonesian archipelago, which he thinks of as his second home.